Frank has been working with every version of Windows on PCs: from Windows 95 in 1995, to Windows 98, Windows 2000, CE, ME, and NT. In this century: Windows XP, Windows Vista, Windows 7, Windows 8 & 8.1, and Windows 10. 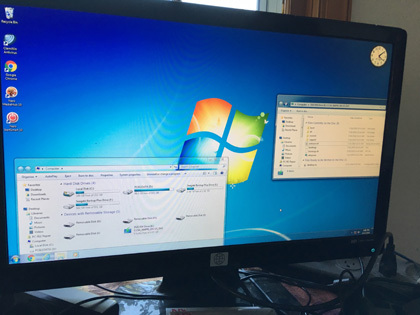 Clients have turned to Frank at ByteWise / PC 911 for tasks ranging from installing or re-installing Windows to upgrading Windows versions. A common trap is that newer software usually is bigger and runs more slowly on older hardware, so matching the most effective version of Windows to your computer is important, and Frank's an expert at it! Many people are comfortable staying at Windows 7 which is fine. If you determine it's necessary to upgrade to Window 10, Frank can customize some convenient desktop shortcuts (desktop icons) to make using Windows 10 more familiar to Windows 7 users. Correct installation of applications software such as Microsoft Office, E-mail programs such as Outlook, and web browsers such as Microsoft Edge and Explorer as well as Google Chrome and Mozilla Firefox are essential to using a desktop or laptop PC in everyday situations with the Internet. Frank is able to restore applications preferences so that you will experience what you expect when you run your favorite programs.